Since we’re raising a child in the digital age, and since he already knows how to navigate an iPad (don’t judge me on that one until you read my upcoming post on tech in our house), we like to make sure he has plenty of low-tech stuff to play with. Stuff he can be creative with. Blocks, vehicles, stuffed animals, yadda-yadda. But he didn’t have any play food, which a recent Parents magazine article singled out as a great toy for fostering creativity. Here let me pause to say that yes, I do read Parents. Rather, I skim it and shake my head at the articles about insanely elaborate decorations for a one-year-old’s birthday party. And pieces about using navy blue eyeliner to make yourself look more awake. But they do run useful pieces like the aforementioned one on raising creative kids. So off I trotted to Toys R Us. 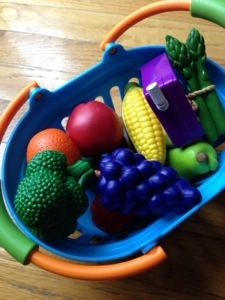 Once I located the play food (with the help of a sales gal — it was my first time there and my head couldn’t handle the onslaught of fluorescent lights and bright colors and brand names), I picked out something that looked fun and took it home. The Boo loved the tiny frying pan and spatula, but he nearly bit through the sausage. 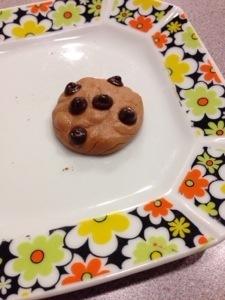 The plastic was so thin I could dent it without much effort, which did not bode well for its life with a toddler who’s currently growing molars. So the set went back to the store and I came home empty-handed because they didn’t have anything that looked sturdier. Or maybe they did and I just couldn’t find it because holy cow, the number of things in tightly packed aisles. That place mussed my aura worse than the grocery store, know what I’m saying? Too many choices. Why do we need that many kinds of cereal? Or tiny Dyson vacuums? Yeah, they make tiny Dysons. Chew on that one for a bit, let me know how it sits with you because it gives me shpilkas in my genecktazoink. At home, I dug out the magazine that had spawned the quest and noted the brand they recommended: Learning Resources. And that, friends, is what I bought. It ain’t the cheapest, but the pieces are very sturdy and shockingly pretty and they offer a bunch of different fun sets. I chose one with a mix of fruits and veggies and minimal junk food (because my kid already loves potato chips, thank you Daddy!) that came with a couple of baskets (because our space is small and I am a Virgo). My only beef with the set is that the baskets aren’t quite big enough to fit all the food in at once, but the Boo doesn’t care about that. He happily dumps them out and refills them over and over. He also adores making sandwiches and offering me bites of cookie. 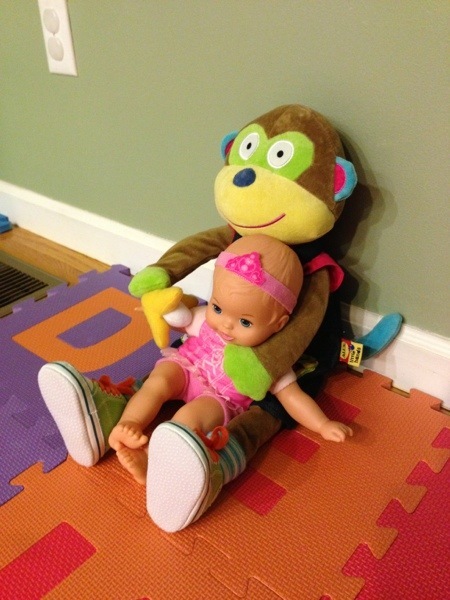 In a recent post I mentioned that Baboo had enjoyed playing with a baby doll at a neighbor’s house. A few days ago, I made good on my promise to let him pick out a doll for himself. Here I will pause to link to a song I hope is no longer revolutionary: William Wants a Doll, from Marlo Thomas’ excellent TV special and children’s album, Free to be You and Me. As it happens, there weren’t a ton of choices at Target. No boy dolls, for starters, and only a few options that looked like actual babies instead of Disney characters or anime princesses in physical form. 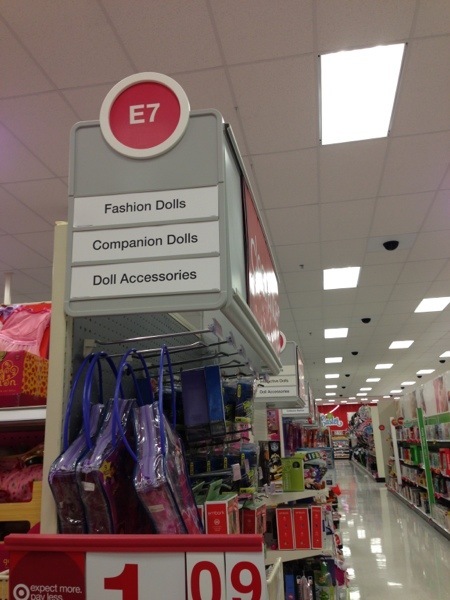 There were, however, tons of “companion dolls,” whatever the hell that means, and accessories, because God forbid your dolly go out without her cell phone and matching purse. Anyway. He seemed to gravitate toward a standard sort of doll, reaching out for her and smiling at her and so on. 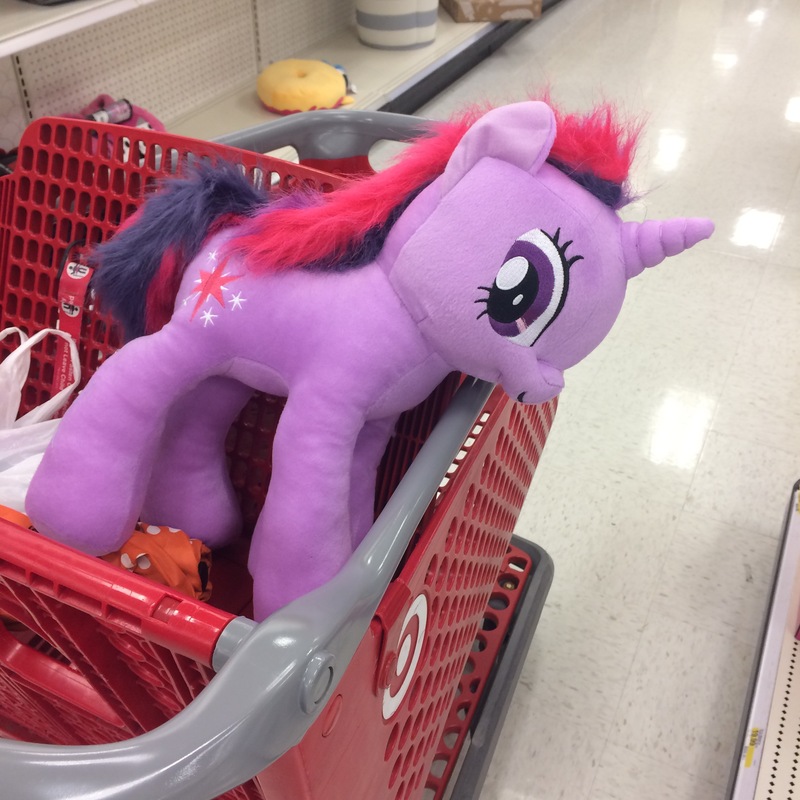 I stuck her in the front of the cart with him, and he continued to touch her face and babble at her as we finished shopping. 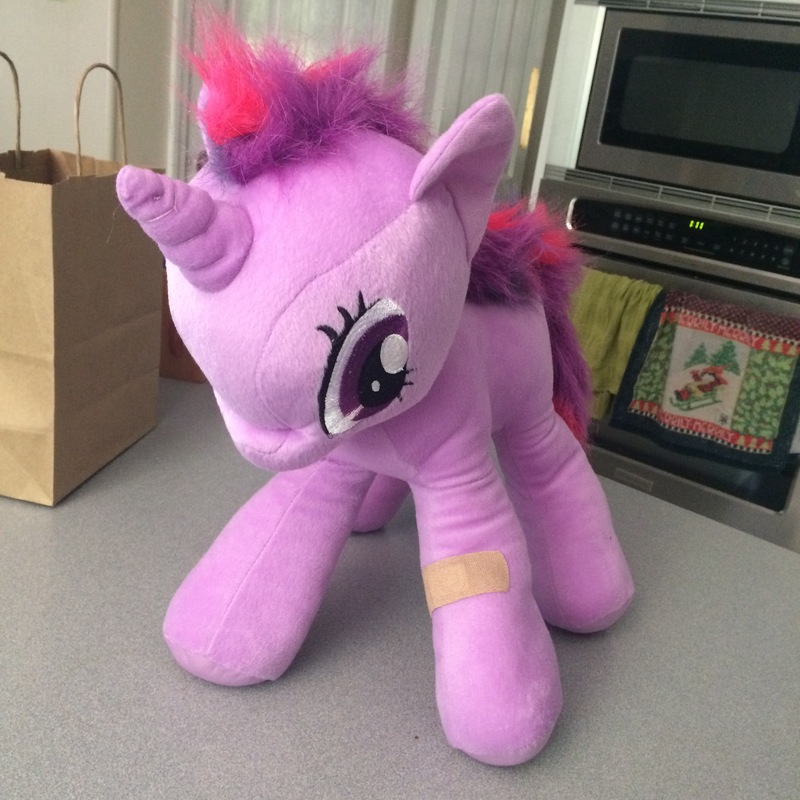 Once we got home, I took her out of her box and handed her to Baboo. He smiled at her, and then gave her to me. Over and over. And gave me her bottle, because true to her newborn form, she is always hungry. A friend who is wise to the ways of babies and a doula said he’s doing this because he knows I’ll take care of her. Aw. How sweet. But how am I supposed to get anything done? I can get him to wave the bottle near her face occasionally, but he really, really wants me to hold her. Usually when I’m trying to get a round of bottles washed or do some food prep. I have a few key ploys for keeping Baboo (not his real name) happy while I cook or do dishes or one of my 88 chores in the kitchen/dining area where we spend a LOT of time. Chief among said ploys: Fun stuff on the fridge. 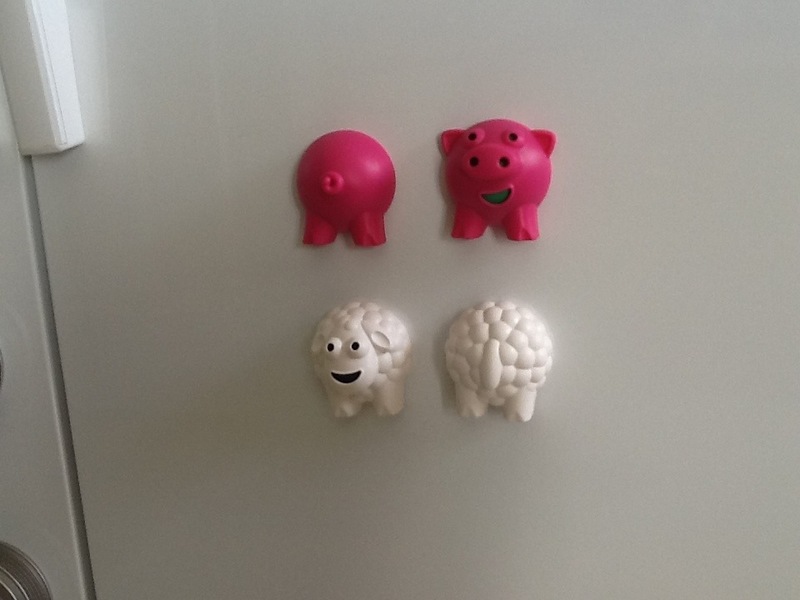 They’re meant as a farm animal play set, but they work really well as fridge magnets. 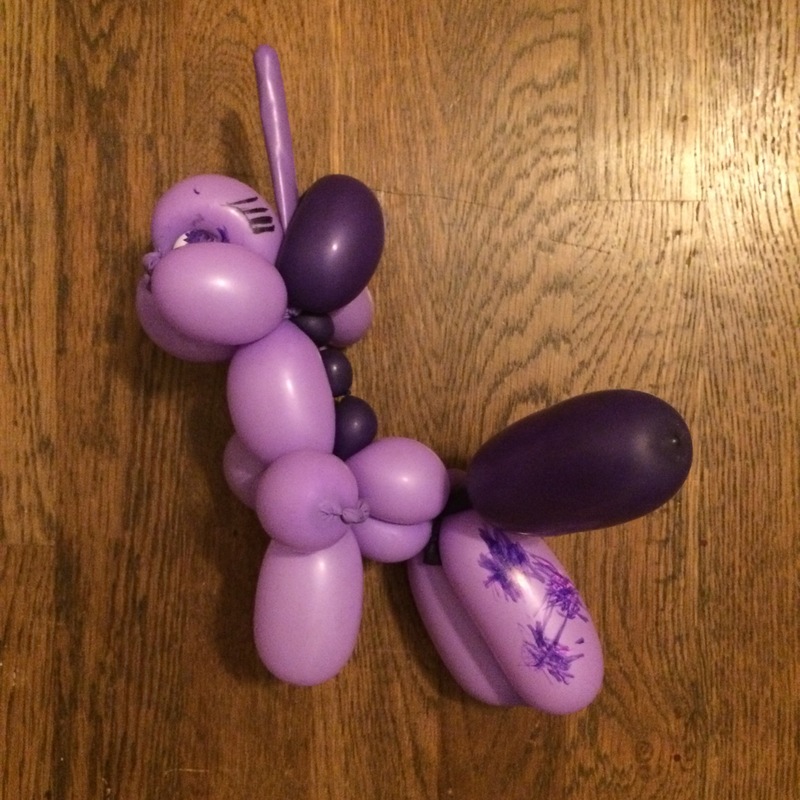 The animals are soft molded rubber, so they’re nice for the baby to both grab and gnaw on. They’re made in Switzerland, and with European baby safety standards being what they are, I know they’re safe for him. 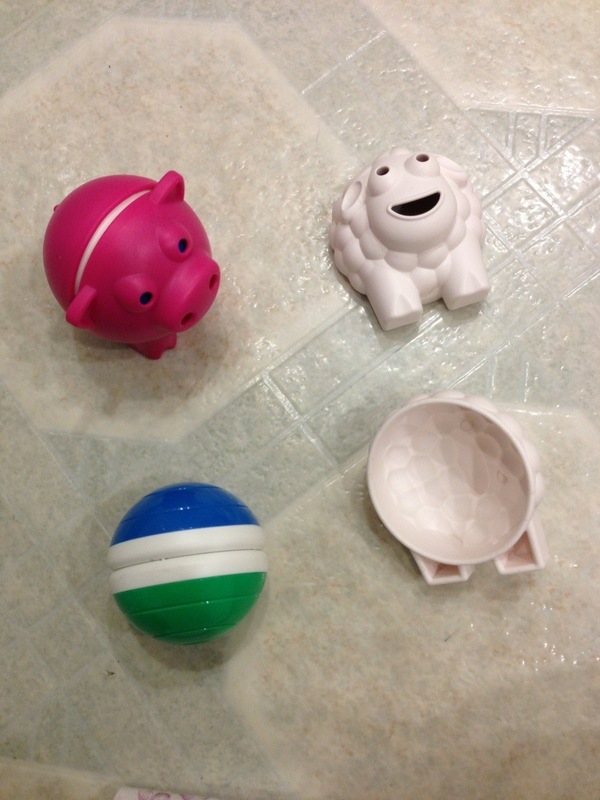 The rubber animal parts fit around magnetized balls, and they’re not that hard to pop off, which ends up providing more entertainment for the wee one. They come together to make free-standing toys, too, so he can play with them as he grows. Bonus features: I can use them to teach him animal noises, which he thinks is hilarious. They seem to be carried at quite a few places, and of course, Amazon has them.